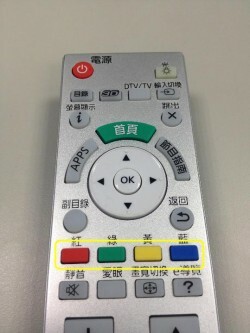 In our introductory post, Keyboard events in Firefox OS TV, we described four keyboard event scenarios triggered by the Info key on a Smart TV remote: SYSTEM-ONLY, SYSTEM-FIRST, APP-CANCELLED, AND APP-FIRST. 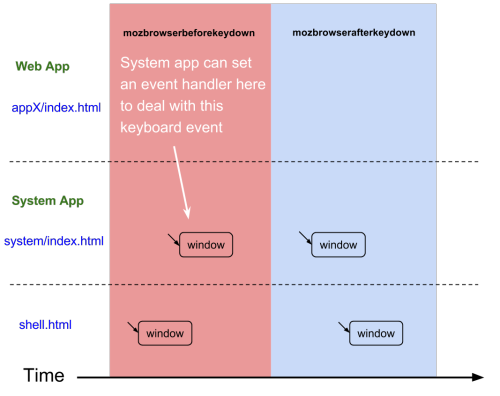 We explained how these keyboard events are activated, described the default sequence of events, and explored the iframe structure in Firefox OS and its embedded browser, in order to understand how developers can implement the four keyboard event scenarios. Now we’ll take a closer look at each of the four scenarios, complete with example code for each event-handling scenario. If a keyboard event is categorized as SYSTEM-ONLY, then the desired response is defined in mozbrowserbeforekey*’s event handler. Once this key is pressed, the system receives the mozbrowserbeforekey* event before the key* event is dispatched to an app. In addition, the key* events dispatch is cancelled once the system event handler is called. Now, we need to figure out a way to stop the event dispatch. Fig 5 – Keyboard events in Firefox OS TV shows that the keyboard events are dispatched to the system process, then also to the app process. To stop dispatching events to the the embedded page, event.preventDefault() is a straightforward solution. Event.preventDefault() is used to prevent the default action. The defined default action of the mozbrowserbeforekey* event is to dispatch the key* event. For this reason, by calling event.preventDefault() in mozbrowserbeforekey*’s event handler, key* events won’t be dispatched. The final result will be the same as shown in Fig 7. This is very similar to the implementation of SYSTEM-ONLY. The only difference — it’s not necessary to call event.preventDefault() in mozbrowserbeforekey*’s event handler. Apps are able to handle the key* event after the system finishes processing it. 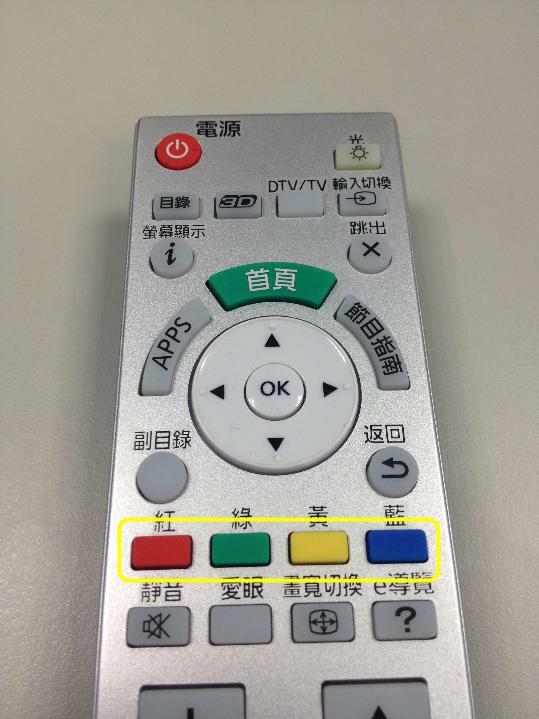 If specific keyboard events are designated for use by apps only, such as those assigned to the four colored keys (shown in Fig 9) on smart TV remotes, then event.preventDefault() will be called in the app’s key* event handler. The event.preventDefault() cannot prevent the mozbrowserafterkey* event from being dispatched to the system, but the property embeddedCancelled of mozbrowserafterkey* will be set to true once the embedded app calls event.preventDefault(). The value of embeddedCancelled lets the system detect whether or not this event has been handled already. If this value is true, the system does nothing. 1 mozbrowserbeforekeydown Receive event ‘mozbrowserbeforekeydown’. 1 mozbrowserbeforekeyup Receive event ‘mozbrowserbeforekeyup’. 2 keydown Receive event ‘keydown’. 2 keyup Receive event ‘keyup’. 3 mozbrowserafterkeyup Receive event ‘mozbrowserafterkeyup’ with embeddedCancelled equals to ‘true’. 3 mozbrowserafterkeydown Receive event ‘mozbrowserafterkeydown’ with embeddedCancelled equals to ‘true’. 3 mozbrowserafterkeydown Receive event ‘mozbrowserafterkeydown’ with embeddedCancelled equals to ‘false’. 3 mozbrowserafterkeyup Receive event ‘mozbrowserafterkeyup’ with embeddedCancelled equals to ‘false’.